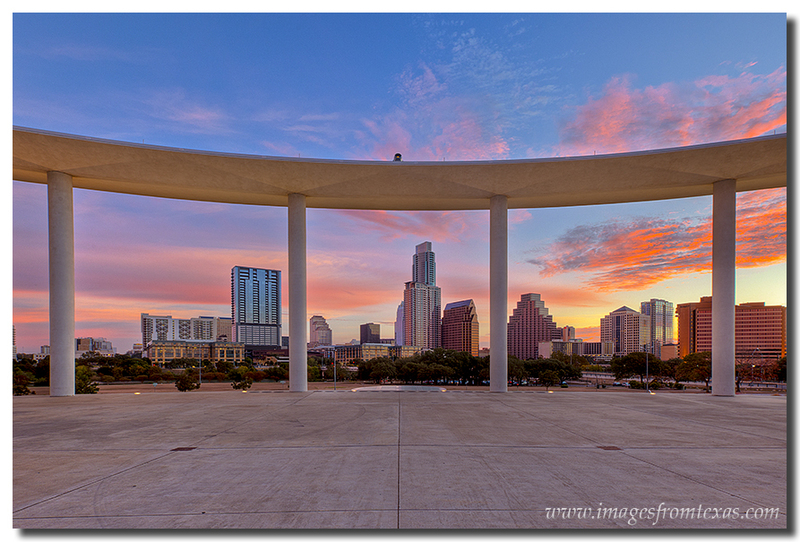 The Austin skyline offers the photographer many options, from sweeping panoramas to close-ups of the skyscrapers. 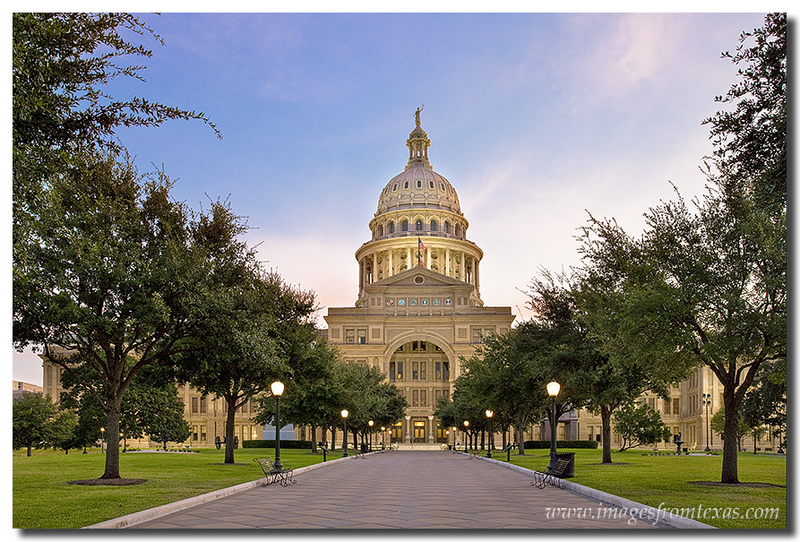 Photographing the capitol city of Texas presents aesthetic challenges, as well. I’ve tried to go out recently at sunrise to play with the new Canon 5DSr – putting it through the rounds and trying to see what 50 megapixels looks like. 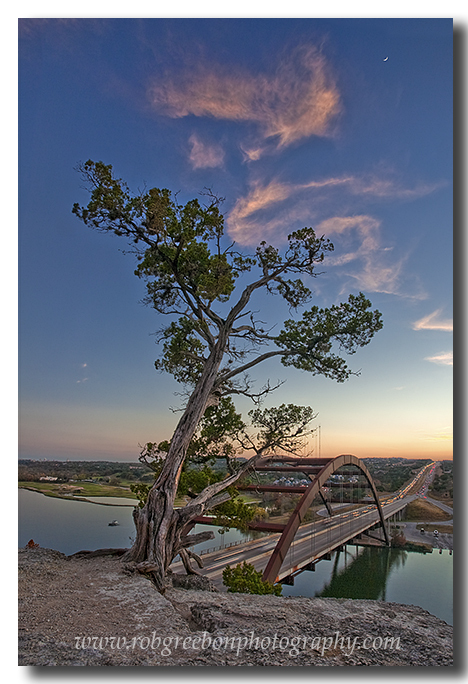 A few of my favorite areas to photograph the skyline come from Lou Neff Point along the Hike and Bike Trail at Lady Bird Lake. All along this path, you’ll find nice compositions of the downtown area. From the Pedestrian Bridge just east of the Lamar Bridge, you’ll also find a photo opportunity of the high rises with Lady Bird Lake in the foreground. 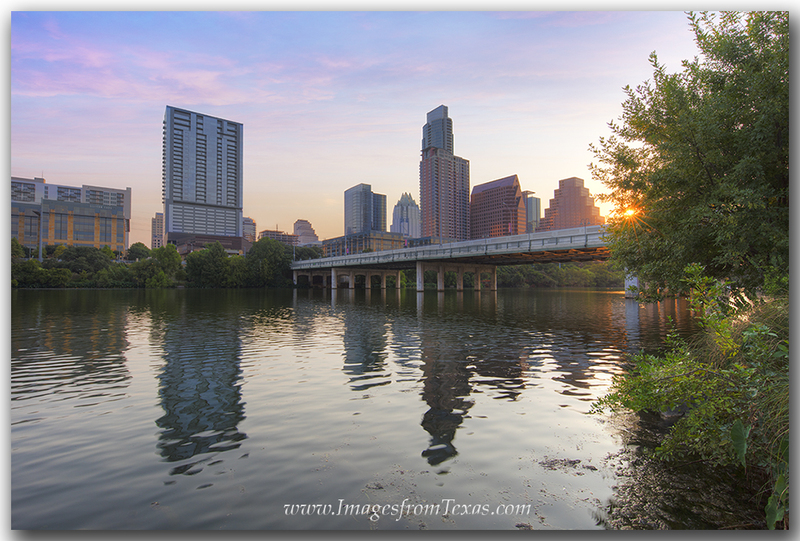 With the First Street Bridge and downtown Austin skyline in the distance, the first rays of an August morning break through the trees. 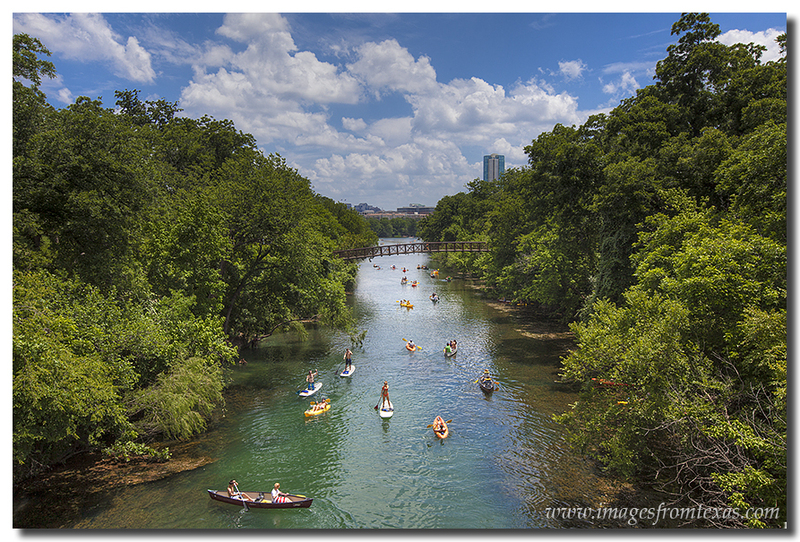 In the foreground is Lady Bird Lake, a mecca for water-sport enthusiasts around the capitol city. Behind me, joggers and bicyclers enjoy the Zilker Park Hike and Bike Trail. 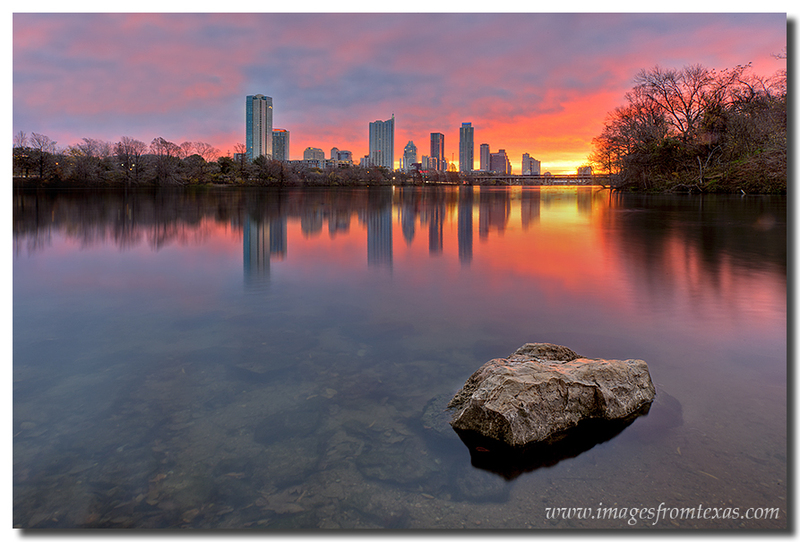 Earlier, I mentioned aesthetic challenges – and here is why: the Austin skyline is growing exponentially. On any given week, you can count seven or more cranes popping into the air, making the downtown area not-so-pleasing. So when I’ve been downtown this past year, I look for scenes where the cranes are not visible. 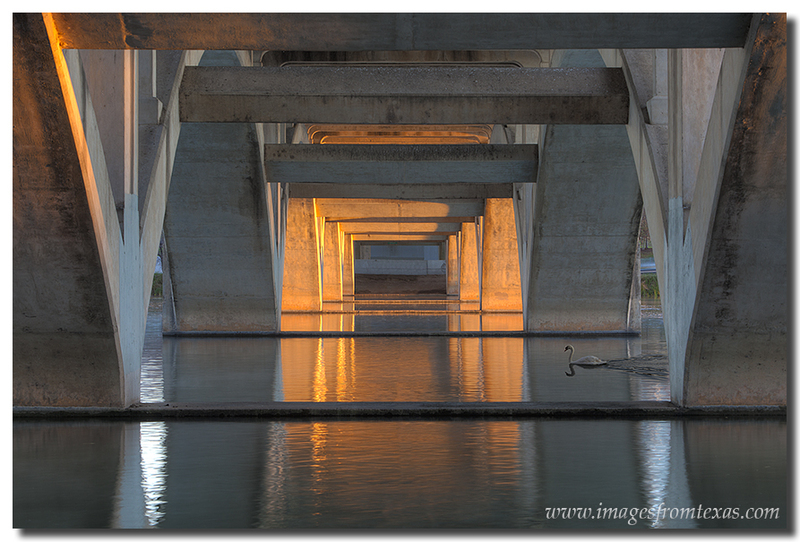 One location with a crane-free view comes from beneath the First Street Bridge. 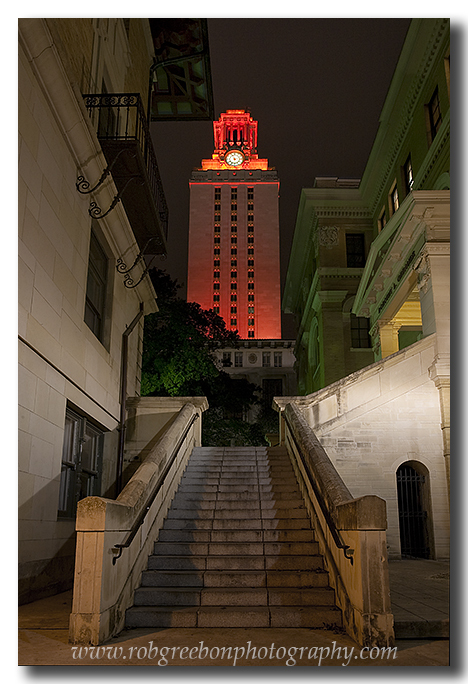 I found another looking at the State Capitol from Congress Avenue on the south side of Lady Bird Lake. But for this view, you have to be careful to avoid traffic (I shoot this area early in the morning on a weekend – fewer cars). 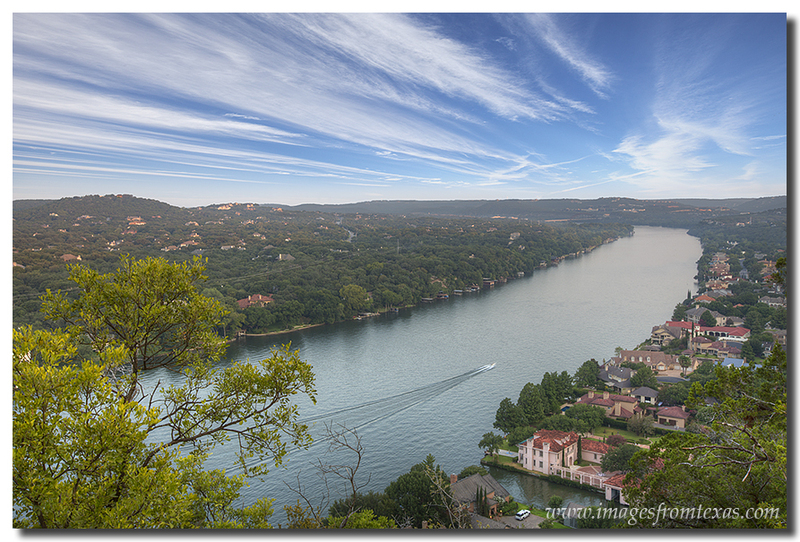 For the wider angle skyline views, and even panoramas, one of my favorite locations is the Zilker Clubhouse on the west side of Mopac. I like sunrise here because you can often have amazing colors in the sky. Nearby – just a small distance from the Zilker Clubhouse gate – is a nearby trail leading to an opening that provides a sweeping view of the city. You have to stand on a rock wall to see above the trees, but the view is worth it. Getting your tripod legs to fit on the small wall can be a challenge, but do-able. 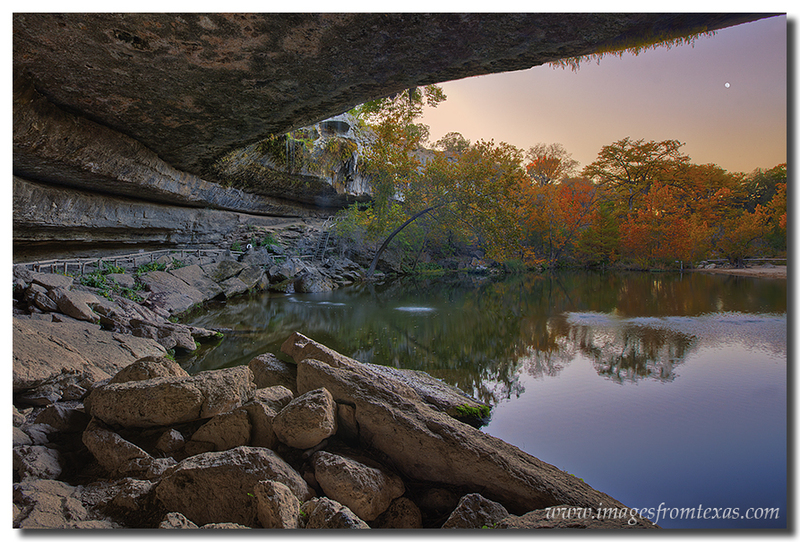 Taking several images from this location to stitch into a panorama scene works perfect for longer lenses (I use a 24-105 or a 70-200 here). For scenes like this, I’ll also go into photoshop and clone out the cranes to give the entire image a cleaner feel. From the top of a trail along the Zilker Park Hike and Bike paths, this view of downtown Austin and the ever-growing skyline is one of my favorites. With the Texas State Capitol on the far left to the tallest building, the Austonian, on the right, the cityscape is nice from nearly any location around the city. 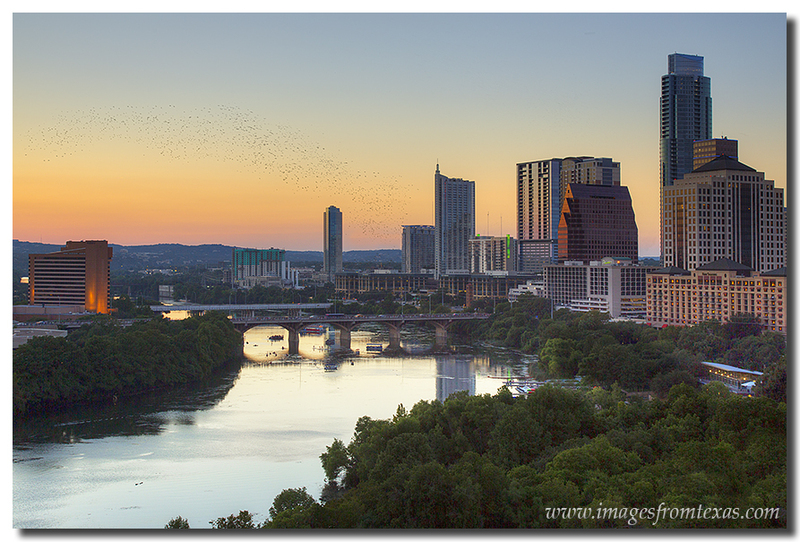 If you want to see more examples of the Austin skyline – both standard sizes and panoramas – feel free to visit my new website’s Austin skyline gallery. The Dallas Skyline – on CBS! Last June, I had a really productive day. 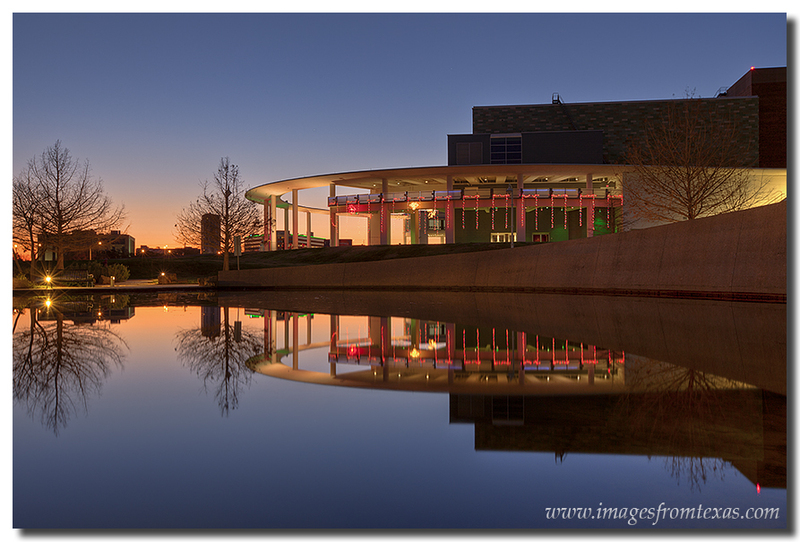 I had scheduled a shoot for a client in Dallas that allowed me to photograph the Dallas skyline at sunset. On the drive up from the Texas Hill Country, I turned off of I-35 near Hillsboro and took the back roads for a ways – exploring and looking for potential sunflower fields. While on that excursion, I came across some of the best and most beautiful Texas Wildflower fields I’ve ever seen – acres and acres of golden sunflowers that stretched to the horizon. I took a few images of these flowers and knew I’d return several more times. I ended up battling traffic heading into downtown Dallas, and after much angst, I made it to my destination. I shot Dallas skyline images and Dallas panoramas for an hour or so before driving back home late that night. 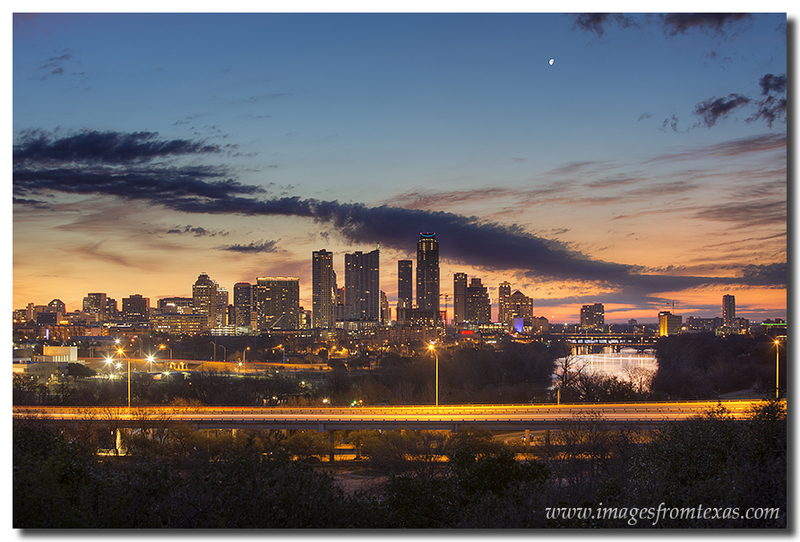 Recently, I was contacted by and sold an image to CBS – a Dallas skyline panorama – which will be used in their television program, Criminal Minds. I’ve been told the image will air on October 16th and will be placed in their studio representing the Dallas FBI branch. Though I rarely have time to watch television these days, I will be tuned in to watch this show (for the first time ever). This Dallas Skyline Panorama was captured from the southwest of downtown on a pleasant June evening. 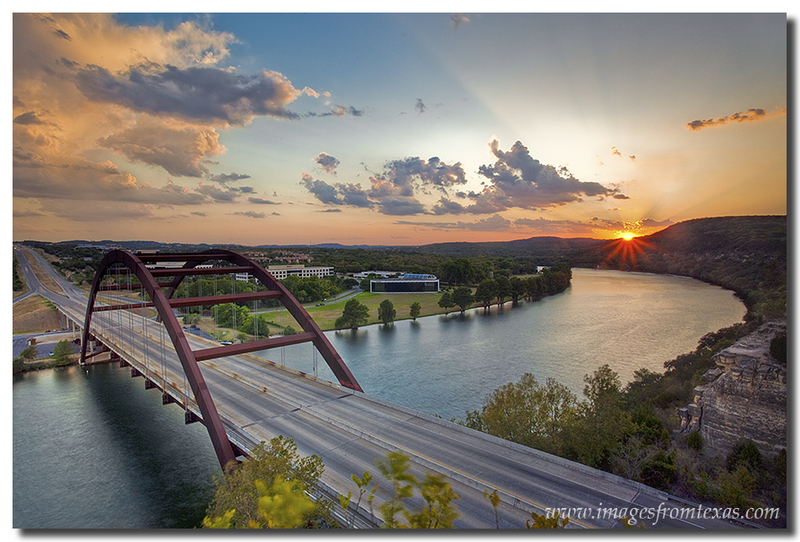 So between the sunflowers photos and Dallas skyline images, that was one drive that was worth the effort. You just never know what you’ll find! 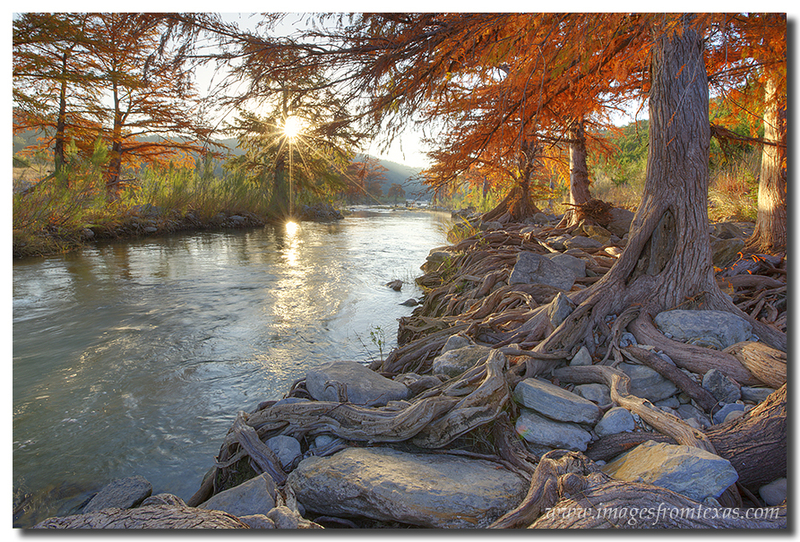 For more images from Texas, please visit my Texas pictures website. 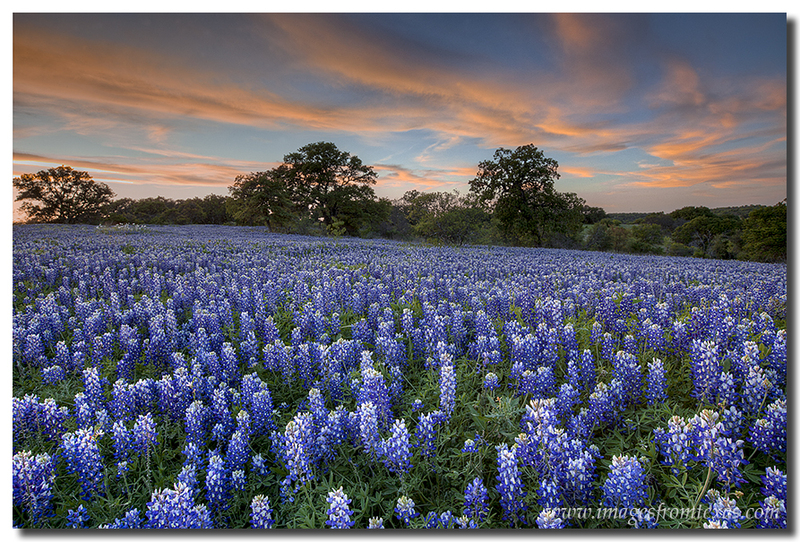 For Texas Wildflower images, please visit either my Bluebonnet and Wildflower gallery or my Texas Wildflowers website. Feel free to follow me on facebook, as well.